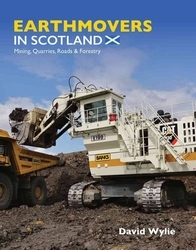 The author presents a collection of 32 field reports from major jobsites across Scotland. The primary focus is mines and quarries, but the roads section also includes cranes and specialized bridge equipment. Along with the images of the equipment, the book includes insightful analysis gleaned from owners, managers, operators and the author’s own observations of the machines and the rationale for their use. 440 pages, hardbound, over 400 color photos.